Bautista … in the spring was reportedly asking for a five-year contract, but the off-season market has not been kind and the hard-hitting right fielder would be expected to sign a shorter term deal with an annual average value of less than $20 million. 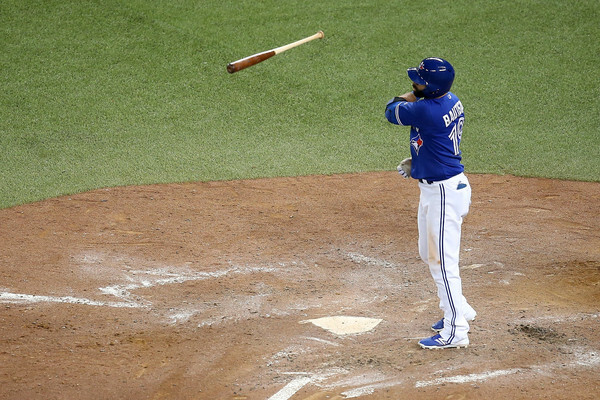 The Rays are also believed to have been in touch with Bautista, but their primary need is short-term at DH. Bautista still wants to play the outfield. It’s probably too soon to begin imagining how Bautista would fit into an outfield that presently includes Yasiel Puig, Andre Ethier, Joc Pederson, Andrew Toles and Trayce Thompson. Unless the Dodgers submit an actual contract proposal — which may have happened, or may happen in the future — this amounts to “kicking the tires” on Bautista. The Dodgers have kicked the tires on many other outfielders, too. They’ve been linked to Pittsburgh Pirates center fielder Andrew McCutchen and Kansas City Royals center fielder Lorenzo Cain, among the sexier names on the trade market. For now, they are mere names bouncing around the Dodgers’ bingo machine. Please play responsibly. This entry was posted in Hot Stove, JP on the Dodgers and tagged Hot stove, Jose Bautista by J.P. Hoornstra. Bookmark the permalink.